Maybe the title refers to the dynasty established by Ben Solo (the Skywalker) and Rey. Is it possible that Kylo's ship is crashing and Rey is jumping out of the way? @snufkin wrote: @spacebaby45678 LOL it's the same location as Lawrence of Arabia and it just occurred to me that the opening shot in the teaser very much matches Prince Ali's introduction on horseback from the horizon. E.G., the antagonistic character Lawrence initially despise for his brutality but eventually becomes his ally/trusted confidante. It suddenly hit me the plot of that movie (which JJ mentioned outright in the Celebration panel) is about a disparate group of warring factions coming together to face a mutual threat. @snufkin I might have to watch the panel again (the pain lol) because I completely missed JJ saying that. @Dar-ren19 It's during the first part when he and Kathleen Kennedy are talking with Colbert. He mentions how special it was to film in Wadi Dumm, same location as LoA. Which nearly three years ago I posted about the two shots referenced in the Jakku segment for scenes with Rey and Finn. Not to mention how AotC (which based on Rey's costume looks like it's going to get referenced a lot) referenced that movie as well as Dr. Zhivago. I'm thinking we're going to see Ben/Kylo not just go from being similar to Pasha/Strelnikov but the opening sequence in the teaser made me think (besides referencing the exact same Leone shot used for Han's confrontation w/Enfys Nest) we'll be seeing Sherif Ali as an influence on his arc and relationship with Rey in the last movie. I'm also betting we'll see something akin to getting warring tribes to unite against a common enemy theme. None of this is a big secret because of the influence on the OT and PT, plus KK has talked about David Lean as one of the filmmakers who inspried her as a film student (and Spielberg is the biggest Lean fanboy around). Also a completely small detail but the "no quarter, no prisoners" line on Crait stuck out to me at the time. Because where have I heard it before??? 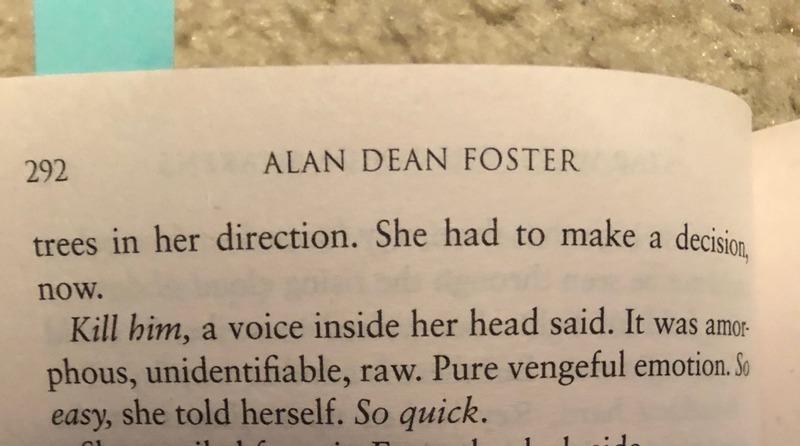 Their initial meeting, Lawrence outright despises Ali for his brutality (My name is for my friends)while Ali likes him immediately and persists until Lawrence comes around to him becoming an ally/confidante. She who will be born to darkness will give birth to darkness." "Only through sacrifice of many Jedi will the Order cleanse the sin done to the nameless." "The danger of the past is not past, but sleeps in an egg. When the egg cracks, it will threaten the entire galaxy." if we think about it, it makes sense right? @vaderito Interesting ideas..thanks for sharing! We'll see. Great image of the JetPack trooper I thought maybe they were on speeders. but jetpacks look really cool! I hope you don't mind I'll respond to just a couple of parts of your post. Thanks for sharing vaderito, I don't read widely all the ideas I'm sure are being circulated.. I don't agree with it being 'obviously a red light saber reflecting off C3PO though' - not obvious to me, but nor do I rule it out. Great finds with Rey's strap! 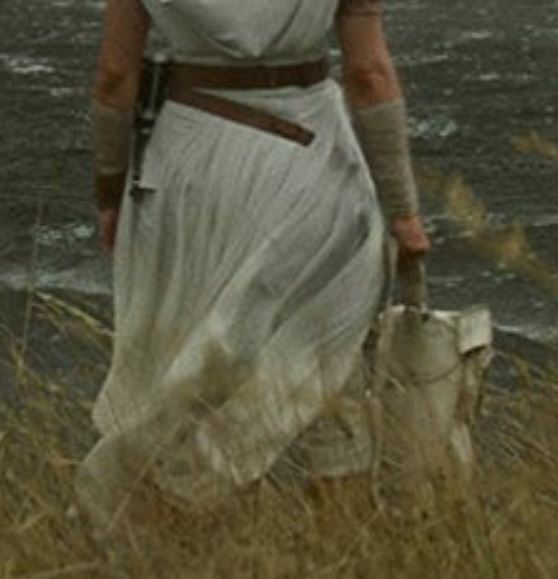 The presence or absence of the staff had me curious... we don't see it at all in the the Rey/Kylo showdown scene.. but we also don't see it when she is on the hilly grasslands. hmm.. might mean nothing! lol. I'll be keeping an eye out for it all moving forward! I'm thinking this is the strap of what looks to be a white back pack(? )/ satchel (?) - which we can see she is holding in the teaser as she looks at the death star wreckage. I'm probably not the first to see it... thoughts anyone? ...edited to add: interesting if this is Endor - Poe's mother was in the squadron that brought down that Death Star! -Hey this is weird. I never got a notification for this reply. Phew. glad I found it! Thanks for responding Forsythia! I have no idea what an ewok theme sounds like lol. I did notice the Leia theme though. so moving!!! Okay so the music is not confirming it is Endor.. but.. it could still be Endor. lol.\ I am trying to not conclude things and to keep as open a mind as I can. -yes I was thinking of these leaked images...This is just my take on things.. I can't find it but I thought I heard at one point she is leading a group of local militia or something, and they help our team.. anyone? -confirms she is a leader.. Anyway, I think the desert sequence comes before the death star wreckage/grasslands planet (which may be Endor) based on Poe's bicep injury. In the leaked images - yeah, it looks to be a similar hilly grassland.. and Poe has the injured bicep. So Jannah and her group (with the weird horses) seems to be there with them. If this is the case, it would seem Jannah doesn't enter the movie in the first desert sequence, but a bit later. But heck, maybe she already knows them all and meets them there. I honestly don't know much. haaa.. I'm curious to track where all the characters are but still veeeery early days... just collecting my thoughts here..
Is Batuu the depart on the adventure point? Chewie - so far we see him in the desert in a few images. We see him on the hilly grasslands too. But we also know that at some point he is off flying the Falcon through hyperspace with Lando..
D-O - it is not at the group farewell by the MF. but is seen with the gang on the hilly grasslands - so guessing maybe they pick it up along their adventure..
C3PO- he seems to follow the gang on all their adventures so far! And.. R2D2? I've not seen him at all...anyone? makes me wonder.. does he stay behind with Leia.. or.. it would be cool if Kylo/Ben got hold of him and watched some old vids of his parents and grandparents! lol. So Umm... any thoughts on when we can expect a trailer? Read the comments too . Has episode 9 leaked ???! The daughter born from darkness is probably Rey according to leaker Rey has Palpatine DNA ,( same leaker from few days ago said this a year ago ), the egg in that prophecy is Rey’s because she is from the future . I found it weird the Last two celebrations were around Easter when the one before was in July ( rogue one celebration ). I think we are meant to think of the trinity ie father , son and grandson ( Holy Spirit ) who in turn begets the father . And because Kylo and Rey share a force bond am betting even in death , kylo will be around Rey ( until she passes and completes their soul ) just like Kanan seemed to be around Hera in Rebels . After looking at this I had a look at the Vader comics too- heavily pregnant Shimi looks like Rey but doesn’t speak ( maybe being thrown into the world between worlds trauma has done this to her ), Padme is in chaos ( like a purgatory in world between worlds )which is probably because the skywalkers are forever in a time loop ( I noticed when Ezra went into the WBW you had straight linear paths and circles - time loops and paradoxes ?). Moreover the Emperor says Skywalker and he are one and they would be indeed if this is true . This also has Adam and Eve vibes ie kylo is father and Rey is mother to the skywalkers the chosen ones and also biblical book of Revelations vibes - ie the beast getting a woman pregnant who would give birth to darkness ( Anakin ) and it ties in with the chosen one prophecy and why different people thought different skywalkers were the chosen ones ( ie they all are the chosen ones ) and also why Rey is called Rey - she is like the queen and founder of the skywalkers . Finally it also brings new meaning to Han Solo ‘s Death is “ I know what I have to do but I don’t know if I have the strength to do it “ and “ grandfather I will finish what you started “ because kylo knew he had to do this even if he didn’t want to . If he didn’t all those he loved would cease to exist but because of his actions he would damn them for all eternity in a time loop /paradox . It’s really tragic and sad . 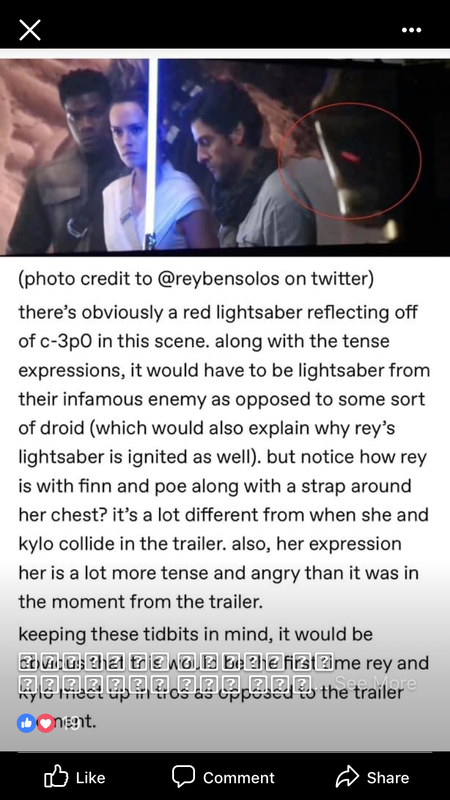 So if this is true we are getting reylo and redemption but very sad way to do it. I’m curious about that bag too. My initial thought was some of the Jedi texts were in there but it’s anyones guess. Having looked at the teaser trailers for TFA and TLJ with 90 seconds each it’s tricky to gauge or conclude what exactly the contents of each film were. For example the KOR appeared in the trailer for a second or two but have yet to play a significant part or have more screentime in this saga. There are always going to be massive omissions, so Rose not appearing really doesn’t amount to much at this stage I feel. Just as John B last IG post calling ‘The Team’ includes Kelly as well as Billy Dee. I’m just gonna wait patiently for that next trailer to see if Rose makes an appearance. "When the righteous lose the light, evil once dead shall return." Palpatine? "Only through sacrifice of many Jedi will the Order cleanse the sin done to the nameless." ? "The danger of the past is not past, but sleeps in an egg. When the egg cracks, it will threaten the entire galaxy." Palpatine Death Star? What if Rey is related to Palpatine? In order for him to come back in the flesh, he needs someone with his DNA? Before Palpatine died he had his contingency plan, maybe he kept his DNA (sperm). Perhaps the leftover of the empire paid someone (Rey's parents) to carry a child and later they abandoned her? JJ said there was more to her parents story. I thought TLJ summed everything up well, but it must be important to the story if he added on. Daisy said it would make sense. What brings me to this idea is a couple of years ago, Jett Lucas did an interview where he said that his father's version of 7, 8, and 9 was like Anastasia (daughter of an emperor). I know Disney bought and changed the story, but apparently JJ was also in talks with George before he sold Lucasfilm to Disney. We know that KK and JJ used pieces of George's story in this present version of the sequel trilogy. Also, JJ spoke with George before he wrote this final installment. Before The Lasti Jedi there were lot of theories how Snoke could be interested in Rey and her power and want her to kill Kylo, but now we know that Snoke really was obsessed with bloodlines and didnt care about Rey with her being no one even with her power. So he probably wouldn't want Rey to kill kylo. IMO Palpatine makes sense. I really don't like the idea of introducing time travel into Star Wars. But there are aspects of your speculation that I find really compelling. Specifically that Kylo's actions throughout the first two movies have to do with a higher purpose that we don't know about yet. That Kylo has received a vision and a clear purpose within the force, something Anakin also saw, a way to bring the force into balance but that required a descent into the dark side. Personally, I don't like the idea that Rey is Shimi. First because she was a slave, she remains a slave, she is resold and bought back, she falls in love with another man with whom she has two children, then she is kidnapped and tortured to death ... I miss the voice "hope ..."
Instead I thought of the image reflected in the cave. I return to my theory that she is a messenger sent by the Force to help the Skywalker dynasty. She has seen herself thousands and thousands of times ... as if she was always born of herself. What if she's a side of the Force that embodies herself to help Ben Solo? It would sound like this: Every age has a legend. I will tell you about Rey nobody, who came from nowhere to help the chosen one to fulfill the prophecy, and how love won over evil. I don’t like what I said either but these leaks ( funnily enough the latest one has now been deleted too ) are making me come to this conclusion . I took screenshots of the leaks if you need to see them including the one about Rey coming from Palpatine. If this comes to pass the story of the skywalkers is tragic and they are stuck in a time loop forever but also what saddens me is the burden that kylo has having to make these decisions and ultimately choosing love over everything because if he had no love for his family and knew what he knew he would make sure it never comes to pass and ensure none of them are born . If this is true I’d like to know what role Finn plays because ever since TFA I’ve thought the showdown Would include him- maybe he kills kylo trying to stop the prophecy but actually enables it anyway ? Or maybe those left behind will start the new world order to fight whatever is coming from the beyond ie grysks and this will set up the next trilogy without force users. Way of doing it and does change how you view the entire saga plus it completes the circle. Rey’s role would be super tragic though . To be honest am hoping these leaks are Colin treverrow’s script but the leaks have been one after the other in the last few days and now those prophecies too in Master and apprentice which could fit those leaks too. Am gonna keep this idea at the back of my mind at this stage but stay open minded - let’s see what we get in the next few months - it’s still early days yet . My goodness, Ben is not going to be his own great-grandfather in love with his own great-grandmother in an infinite time loop. there ha ha ha! Now I need a trailer that leaks the ending with Ben and Rey living happily ever after . Am keeping an open mind everyone as I said above. It will be interesting to hear what Jason has to say ( MSW ) on his patreon site at some point because he said he’s sitting on some big leaks including Kylo’s fate . Fingers crossed it’s positive. I like time travel like Looper, but Looper has already come out, right? Why should they do it the same? I agree with you, the only way for that to work (and it will still be weird ) is if they break the cycle that way. I love your idea . If (and this is a big if ) any of that so called leak is true ( the leaker has deleted the post now and his identity now so am wondering if it’s the same guy that leaked it a few days ago but under a different ID ie a troll )then it could be we are told about the time loop earlier on and what burden Kylo/Ben carries and we are told it has been repeating forever and ever with no end in sight unless someone breaks the cycle and maybe Ben and Rey are prepared to go ahead with it for the millionth time like they always( because love of Leia, Han etc ) have until someone else breaks the cycle . This is where I think Finn could come in . He makes a new or different decision that changes things because of his love for Rey ( you can see how much they care for each other friendship wise ) . At the end of the day Ben and Rey would have have lost their free will because they wouldn’t want to change a decision that could mean Leia is never born etc so I think some one else would have to make that decision and take that step to do it . If I’ve learnt something from fantasy tales it’s often those who are deemed unimportant in the grand scheme of things like the hobbits in lord of the rings that make the biggest difference . Finn is like Han - he’s not a force user or has wizard powers but I think he will end up being the one who changes fate just like without Han the Rebellion would not have won the war . This idea reminds me of a Doctor who episode where the doctor was trapped in a castle and couldn’t get out and break down the wall and this went on a loop for thousands if not millions of years until he figured out a way to break the cycle and then was able to find his home Gallifrey . Even if Jason reveals his leak on Kylos fate i wont believe it until the movie releases because Kelly mentioned the “cover story” which means they filmed a fake ending, also John said there were some changes in the script and even he is not sure of the ending. @Riri wrote: Even if Jason reveals his leak on Kylos fate i wont believe it until the movie releases because Kelly mentioned the “cover story” which means they filmed a fake ending, also John said there were some changes in the script and even he is not sure of the ending. I totally agree. I have a hard time believing someone outside of the production knows how it ends when even the actors don't know. More than likely Jason knows an ending for Kylo, but not the real ending that only Daisy, Adam, JJ, Kathy, the editors and a handful of other in "deep LucasFilm" are aware of. Like others have said there's absolutely no way a podcaster knows the actual conclusion when even most of the actors claim not to.